Acquiring direct peers and fleet-footed Fintechs that own prized IP is just one means of accessing growth through collaboration. Less formal alliances may be a more appropriate, and altogether less costly, approach. Collaborations falling short of outright M&A are on the rise as firms seek more flexible and agile working relationships with their partners. Sometimes these alliances may lead to a deal, as the businesses naturally move closer together through their cooperation. However, there remains the freedom to join forces on a specific product or innovation and utilise complementary strengths — whether that be technology, talent, innovation, market presence or any other competitive advantage — but otherwise maintain independence. Almost nine in 10 (88%) fast-growing financial services companies have taken a minority stake in another company, potentially giving them access to a business without an outright acquisition. Such alliances may give rise to issues of control and governance, which need careful consideration and management, but nonetheless represent an important opportunity for many businesses to collaborate. While these arrangements carry risks, such as lack of control for the investor, they also offer advantages for both parties. They can be a way of harnessing the innovative and entrepreneurial spirit of a smaller company while allowing it to retain its independence, or to access a specific tool or technology while leaving the business free to continue developing it. Other types of alliance are in vogue too. For example, almost three-quarters (74%) of rapidly expanding financial businesses have entered into licensing or franchising agreements. It is also notable that the vast majority of fast-growing financial services businesses (84%) expect to see more partnerships with Fintech and Insurtech firms over the next three years, which should come as little surprise given their proven ability to innovate and disrupt the financial services sector. 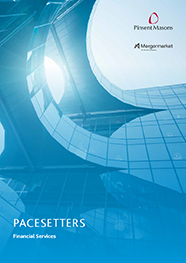 Of course, some of the businesses surveyed in our new Pacesetters report are themselves Fintechs, so it should be expected that strategic collaboration will occur among these nimble and innovative firms, not just between traditional financial institutions and start-ups. For those businesses — big or small, young or old — that are able to harness the innovative and entrepreneurial spirit of Fintechs, the potential of such alliances is immense. Across Europe, banks are beginning to form strategic partnerships as a result of the Payment Services Directive 2, which requires banks to offer access to customer data to authorised third parties to increase competition. There is an incentive for lenders to work with Fintechs for mutual benefit rather than simply giving access to valuable data. In the UK, a number of market-leading banks including Royal Bank of Scotland and Santander have been working hand-in-hand with Fintechs in order to establish guidelines, developed by the British Standards Institution, that will support working relationships between these parties. Alliances are only just beginning.